Happy birthday Take Eat Easy! Yesterday, Take East Easy blew its first candle!!! It’s already been a year since they launched their concept, and for the occasion they even revamped their website, giving it a fresh & clean look. We got to discover a lovely new place right in the heart of Flagey. Epaulé-Jeté opened recently its doors and it looks like they are on the right track to become one of Brussels’ best bars. Check their website to see their agenda! The setting is already gorgeous per se but the people and the organisation were actually the cherry on the cake. The Take Eat Easy team had partnered up with some amazing people for the event too: BAKE, El Verde, Mo Mo & Yeti. We had tons of fun celebrating their online success-story. 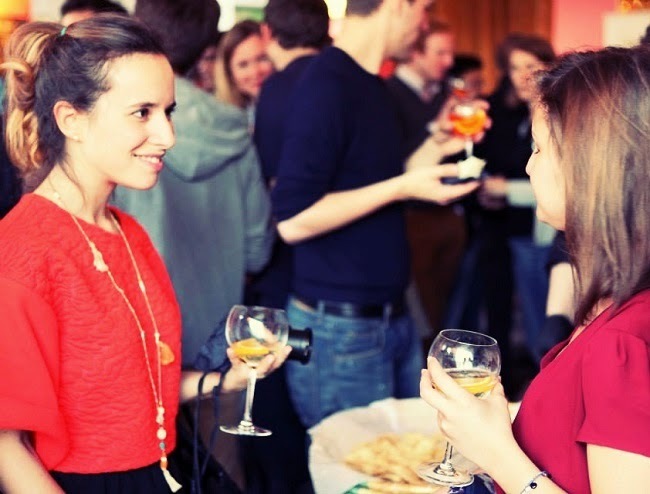 It was also the perfect excuse to mingle and get to meet exciting people like Chloe co-founder of Take Eat Easy and of the Brussels Kitchen blog. We got to catch up with Elodie of Love & Tralala who told us all about her Creative Sundays. (By the way, soooo looking forward to the one at Les Midinettes!). Besides all the awesomely delicious food that we got to try, we also had a glass of Brusseloise, a Mirabelle plum wine. With ice cubes and a slice of orange. AKA the perfect spring drink for your afterwork .